WE SHARE OUR EXPERTISE WITH YOU. 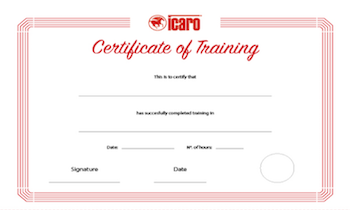 people who attended our courses will be able to teach how to correctly our machines, thus guaranteeing top performances, as it is expected of an Icaro machine. Additionally, you can visit our FAQ’s area, where we give you the chance to learn how to get the best out of our machines by watching technical video tutorials. Icaro Machinery stands for the best quality combined with utmost attention to our clients’ needs.